Great, thanks! A very useful pre-runtime environment to test and improve any combination! 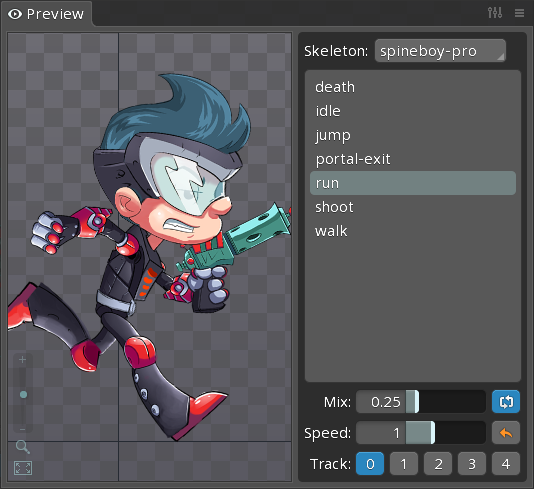 I like the possibility to adjust an animation in the editor while seeing a running live preview with immediate changes. It's quite a bit better in 3.6.23-beta! Shouldn't be any more bugs and the UI is a bit sleeker. There's now a collapse button in the Preview pane header. Great work guys with Preview pane, love it! Artist would be able to test and set-up bunch of animation mixings that should be played in specific situation and developer would be able to play those using one line of code instead of playing as much of animation as the mixing contains. Don't know if that make sens for you guys ? Preview makes the most sense to test transitions. 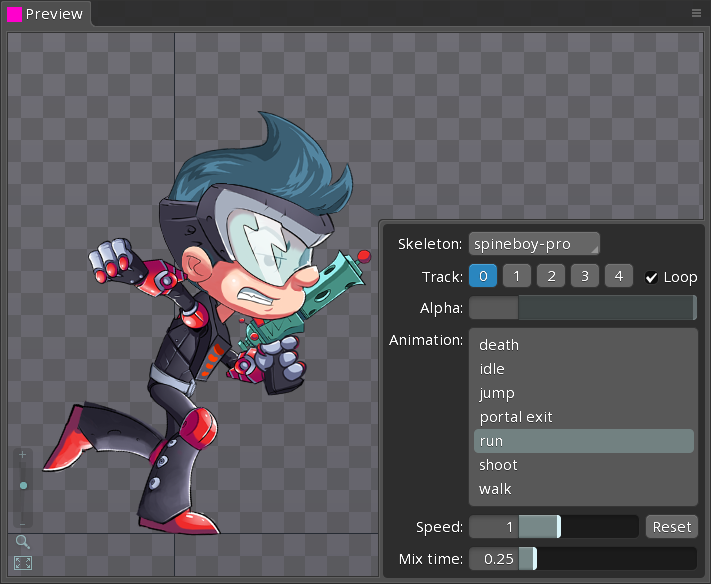 Spine may allow setting up mix durations (for AnimationStateData at runtime) in the editor. Playing back a sequence of animations as you described might be useful in some cases, but I think most games are more dynamic and it's already not hard to queue up animations at runtime. What might make sense for Preview is to press a record button, set up some animations, then stop. This would let you play a complex mixing situation repeatedly. For some mix situations you can set them up by changing the speed to 0 to stop everything, adjust the mix duration for the next transition, click the next animation, then increase the speed and repeat the process for the next transition. Is there anymore documentation on how you setup preview to view how the animations look back to back? I've been messing around with preview, but it seems to only combine the animations together rather than play one then the other. Sorry, we don't have documentation yet. To play one animation, then another, you need to play the first, wait, then play the second. In the future we plan to have a record and play button, so you can repeat a sequence. Very useful feature! Ability to record a sequence sounds great. Ability to play selected animation once instead of looping would be great. Ie i have an idle animation on track 0 and want to play some other stuff on other track(s) once. Do you think you can add some "keys", some sequence steps, or something, to play several animations without clicking? My point is, in the game I'm working on, I need to play several animations one after another, and the mix is creating the interpolations between them. I wish I could simulate this with the preview, but as it is right now, I can only test 2 animations clicking manually on them. So I'm never sure I clicked right at the end of an animation. What if I could choose to set animations in the order I want. So I'll be sure each animation will wait until the end, before going on another animation. This way, I could test a proper sequence playing beautifully with the mix. So for example, on this quick mock up, the 'idle' animation will be played 2 times, at first and at last. Yep, we will be improving it to allow more complex playback. One way is to record animation changes, then allow those to be played repeatedly. This is probably the first iteration. It would still be hard to play an animation exactly at the end of another, so after that we'll do something more complex to allow a list to be specified.